Alexander Kaganovsky was born in Kiev, Ukraine. He had his first music lessons at the age of five. Only a few years later he played as a soloist for the first time, and at the age of 16 he won the Ukraine Competition. He continued his studies at the Tel-Aviv Rubin Academy of Music with Prof. Uzi Wiesel and won first prize at the Academy’s Competition. 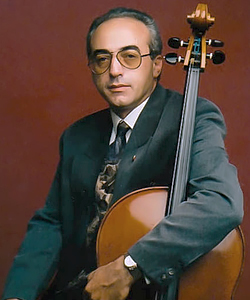 In 1985 he was awarded first prize in the Israel Broadcasting competition, and since that year he has also been a member of the acclaimed Israel String Quartet. Since 1998 Alexander Kaganovsky is living in Switzerland. Alexander Kaganovsky has participated in numerous festivals, such as Klangbogen Festival in Vienna (Austria), Catania Festival (Italy), Cesky Krumlov Festival (Czech Republic), Badener Music Festival, Murten Festival (Switzerland), Oslo Festival (Norway), Moscow Spivakov Festival and Masterclass (Russia), International Festival and Masterclass Moulin D`Ande (France), Novosibirsk Festival (Russia), Cartago Festival (Tunis), Bachwochen Thun (Switzerland) Schubertiade Schnackenburg (Deutschland) Festival Echternach (Luxemburg), etc. He has played as soloist with orchestras in Germany, France, Israel, Italy, Luxemburg, Belgium, Switzerland, Austria, Holland, Spain, Portugal, Sweden, USA, South America, Japan, Hungary, Poland, Croatia, Slovakia, Macedonia, Serbia, Armenia, the Czech Republic and Russia. He has given Masterclasses in Roladseck (Germany), Bratislava (Slovakia), in the UNESCO Masterclasses under guidance of Yehudi Menuchin, at the European MusicAcademy in Schengen (Luxemburg), France, Israel, Russia, Japan, Switzerland, and Ukraine . He has played as soloist with many known conductors such as: Rudolf Barshai, Gary Bertini, Avner Biron, Ernst Bour, Andrey Boreyko, Simon Friedman, Charles Groves, Hughe Wolf, David Robertson, Arnold Katz, Dmitri Kitayenko, Christoph König, Nathan Rachlin, Shalom Ronly Riklis, Mendi Rodan, Doron Salomon, Stanly Sperber, Amos Talmon, Mario Venzago and Benjamin Yusupov . His wide repertoire ranges from Baroque to contemporary music, and some pieces have been especially written for him. Kaganovsky has made many recordings for radio, TV and Damon them CD’s Recorded by ZPEX and J.O.D Japan, and Kaganovsky Sound (Swiss).